Port Blair, Nov. 5: Air Chief Marshal NAK Browne, PVSM, AVSM,VM, ADC, Chairman Chiefs of Staff Committee (COSC) and Chief of Air Staff (CAS),MrsKiran Browne President, Air Force Wives Welfare Association (AFWWA) accompanied by Air Marshal PK Roy, AVSM, VM, VSM, ADC, Commander-in-Chief Andaman & Nicobar Command (CINCAN) and MrsRanjna Roy, arrived Port Blair on 04 Nov 13, after reviewing Air Force Station, Car Nicobar. At Port Blair the Chairman COSC and CAS reviewed operational and administrative aspects of Andaman and Nicobar Command and stressed upon continued focus on infrastructure development as a security imperative. In his address to officers of the Unified Command he emphasised the importance of ANC as the nation develops unified structures in her Armed Forces. He also highlighted how the Unified Command is ideally suited to provide for not just security of the Islands but can be crucial in Aid to Civil Power especially in times of crisis/ natural disasters and also stated how the highest echelon of the Govt and Armed Forces remain sensitive to the security imperative. The Chairman COSC further emphasized that ecological sensitivities and security infrastructure development will have to be balanced. The Chairman COSC and CAS alongwith Mrs Kiran Browne visited Cellular Jail and Ross Island, sites of historical importance during the short visit. 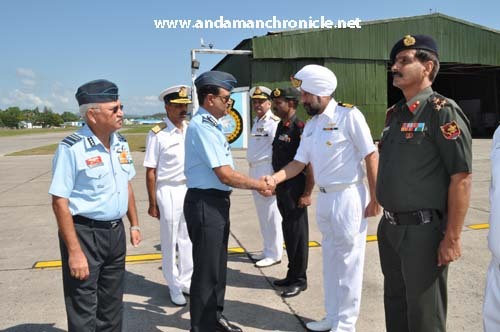 He was seen off by Air Mshl PK Roy,AVSM, VM, VSM, ADC, and Mrs Ranjna Roy at INS Utkrosh.